Κάντε μία ερώτηση για το ταξιδιωτικό πακέτο "Trekking στη Σύρο"
Πόσο κάνει 16 + 6? An interesting choice for the demanding visitor is the trekking trails on the old roads of the island which used to connect the settlements and were paved in their biggest part, as well as the trails which are used as passageways for the crops, the pastures and as an access to the hardly accessible coasts. The trails which served the transportation of marble from the old quarries to the cargo ships through the little ports of Ano Meria are interesting. 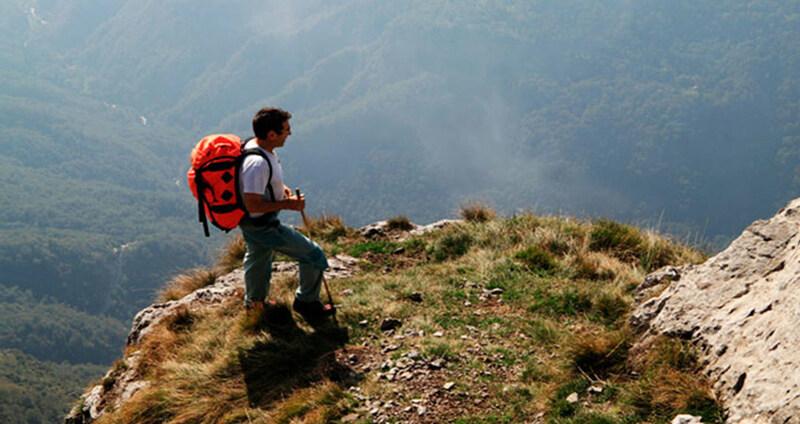 10 Routes characterized as Culturally Interesting have been chosen by the Region of South Aegean for these trekking trails. The 7 first Trails form the network of Ano Meria in the north of the island, an area which maintains its natural and settling physiognomy almost untouched by modern intervention. The rest 3 Trails cross the central part of the island from the east to the west and vice versa, connecting Ermoupoli and Ano Syra to the most focal settlements, the important locations and the coasts of the area. 1. Dili (Panachrantos) – Richopo (2km – 40 minutes). A route that offers a beautiful view towards Ermoupoli. It leads to the small rural traditional settlement of Richopo, which is in a position of broad oversight of the marine horizon in the east. 2.Richopo – «Pherecydes Cave» – Platy Vouni (2km – 30 minutes). Walking from Richopo towards Platy Vouni, the walker meets a cavernous cavity, which is believed to be the cave originating from the island pre-Socratic philosopher Pherecydes. The ending in Platy Vouni provides the walker with the experience of his acquaintance with the liveliest rural settlement of Ano Meria built in an idyllic environment. Walkability: Good. Patchy difficult at the section Chalandriani – Kastri. For the time being roughly sign-posted. This route crosses the sloping field of Chalandriani, where numerous tombs of the early-Cycladic period have been found, and after a short ascent to the steep slope of Kastri, it leads to the early-Cycladic acropolis, where the bases of the fortification and residential foundations are preserved. 4. Kampos – Lia (1.5km – 35 minutes). Walkability: Good. For the time being roughly sign-posted. Before the sandy beach of Lia, the route passes by the cave of Mentonis and Aerolithos (a rare geological phenomenon) which rises in the middle of the trail. 5. Kampos – Gria Spilia – [Grammata] – Diapori (3.5km – 60 minutes until Grammata, 4.5km – 1 hour 20 minutes until Diapori). Walkability: Patchy difficult. For the time being roughly sign-posted. A trail once passed by the workers of the quarry in order to load marble at the little port of Grammena. From Kampos, after 10 minutes walk, the hiker meets a half-ruined building, where there are still remains of hand saws with which the workers used to cut the marble, until the Occupation when the quarry operated. The route continues among stone walls, sages and thyme. Going downhill, the bay of Grammata emerges among the gorges. The signpost on the rocks shows the way to the beach, up to the point where the route reaches a well. From there a dense clump of pine trees begins stretching up to the shady beach of Gria Spilia (Old Cave). Across, on the smooth rocks, the walker can up close distinguish the inscriptions which gave the area its appellation. 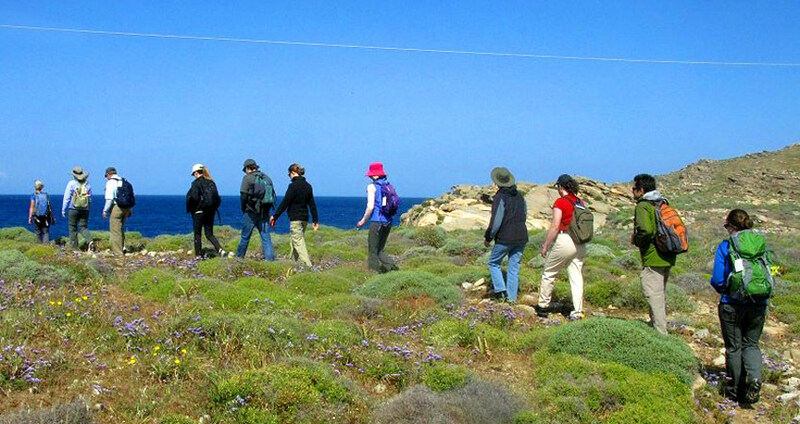 While enjoying a panoramic view to the sea and after a difficult access to the steep slope, the trail is completed on cape Diapori, the northernmost end of the island. Walkability: Moderate to good. For the time being roughly sign-posted. The trail starts near the chapel of Agios Panteleimonas. Walking to the mountain side across, along the stream, it bifurcates and alternatively it leads to the peaceful and eerie bays of Aetos and Varvarousa. The alternations of vegetation along the route are impressive. 7. Chartiana – Delfini – Kini (3.5km – 1 hour 10 minutes). Walkability: Difficult. It is not sign-posted. The trail is parallel to the ravine of Kakos Potamos and Delfini. You will enjoy a sunset of unique beauty from the beach. It is worth continuing to the coastal trail up to Kini offering a special view. 8. Ermoupoli – Piskopio – [Monastery of Agia Varvara – Kini] – Spring of Trypiti – Dani (4.2km – 1 hour 25 minutes). The old stone-paved road which connects Ermoupoli to the holiday village of the island, lush Piskopio, is included in this route and it has been declared a protected newest monument. From there the route goes on in the trail which passes behind the monastery of Agia Varvara and the spring of Trypiti, reaching up to Dani. Close to the monastery there is a bifurcation leading to Kini. 9. Kini – Loto – Dani – Galissas (3.8km – 1 hour 15 minutes). A route with excellent view towards the western coasts of the island. Starting from the beach in Kini, it meets the previous one in Dani and it ends to the beach of Galissas. 10. Piskopio – Voulia – Alithini – [Agia Paraskevi] – Ano Syra – Αgios Athanasios (4km – 1 hour 15 minutes). Walkability: Very good. For the moment only the section Piskopio – Voulia – Alithini is sign-posted. A landlocked route which connects lush Piskopio to the much-sung amphitheatrical location of Alithini and Ano Syra, the historical traditional settlement of the island with a strongly medieval fortress physiognomy. The walker, following the wide cobbled-trail afterwards, leads to the church and the spring of Agios Athanasios, deep in a ravine. Το group δεχεται μέχρι 10 άτομα. Προλάβετε! Πόσο κάνει 8 + 6?